This year two outstanding educators with vast experience working, coaching and inspiring in Indian country have been asked to help prepare Wings athletes for competition. Todd County High School (Mission, SD) cross country and track coach Tonya Whirlwind Soldier will play the role of coach on the women’s side. James Nells from Riverside Indian School (Anadarko, OK) will lead the men. Both will be in regular contact with those runners selected for the Wings team as they train through the winter in preparation for February’s race. Wings athletes can feel confident tackling their prescribed workout regimen knowing there is a support system beneath them. In the event of sickness, injury, personal strife and/or unusual fatigue, coach Nells and Whirlwind Soldier have the knowledge these athletes need to get through the difficulties of training and perform like champions come February 2nd. Both coaches will travel with the team to St. Louis. Pat Tyson, head track & field/cross country coach at Gonzaga University and long-time Wings supporter, has agreed to serve as a consultant for both coaches and Wings program staff as they construct and adjust workout schedules to best fit the training styles of selected athletes. The added structure and support provided by the 2013 coaching staff marks the beginning of a new and improved era of Wings athlete development. The organization is excited to see how increased communication and guidance from these coaches will benefit the performance, motivation and attitudes of the talented young runners that make the Wings team. 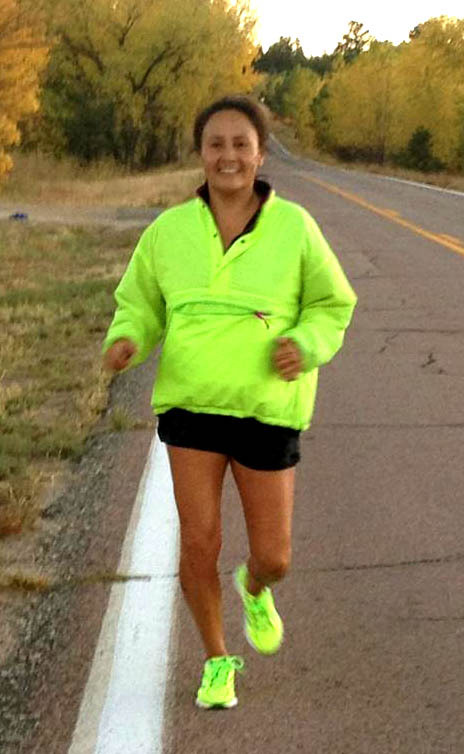 Tonya Whirlwind Soldier is Sicangu Lakota from the Rosebud Indian Reservation in South Dakota. She is an avid runner and has mentored Todd County HS athletes as a coach for more than a dozen years. Apart from fostering many multi-year state qualifiers and champions, coach Whirlwind Soldier strives to see her runners succeed off the starting line as well. Athletic and academic achievements go hand in hand on her teams—Whirlwind Soldier’s athletes have maintained a combined grade point average (GPA) of 3.0 or higher throughout 7 of the last 9 seasons she has coached. Besides playing the part of coach, Tonya is the loving single mother (and grandmother) of three young men and baby boy. She works on the Gang Task Force as a security guard at Todd County HS and serves as the junior class advisor. She is currently working on three college-level degrees and recently earned her Basic Emergency Medical Technician (EMT) certification. On top of all this she has served as a Wild Land Fire Fighter for the last 15 years. James Nells is a long-time Wings supporter and a steadfast mentor for runners of all ages, races and creeds. Though his roots lie on the Navajo Nation, he has worked as an educator of Native youth in Oklahoma for more than 20 years. He has served as head cross country and track coach for Sequoyah High School (Talequah, OK), Bacone College (Muskogee, OK) and Riverside Indian School where he remains today. During his tenure he has helped his high school athletes earn four state team titles and four runner-up trophies. His Bacone College team placed 12th at the National Junior College Cross Country Championships in 2000. As a former Wings USATF Cross Country Championship coach he has led Native athletes to two national titles and one second-place team finish. In 2012, Coach Nells was an integral part of Wings’ successful expansion of summer Running & Fitness Camps to Native communities in Oklahoma. Coach Nells attended Haskell Indian Junior College in Lawrence, Kansas and graduated from Central State University, Edmond, OK. During this time he achieved All-American status as a college-level cross country and track athlete. Post-college, Mr. Nells served 8 years in the US Army where he took part in Operation Desert Storm with the 2-16th Infantry Rangers. James and Elena, his wife of 28 years, are proud to have raised seven children.